Thank you for a wonderful job well done. Your pride in your job shows through your work. We will see you again the next time we need windows. 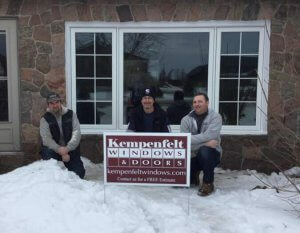 Definitely recommend Kempenfelt Windows & Doors. I was very happy with the installation. I had no clean up to perform afterwards which surprised me. The crew kept me up to date during the installation and were very quick while at the same time very good. I will definitely recommend the company to everyone I know. Considerate and professional service, quality of products, skilful and prompt installation – this describes Kempenfelt well. Over 8 years we have had 3 large double doors and 4 large windows replaced by Kempenfelt at various times and in various weather conditions. All were done so well. Today’s installation was not easy – frigid weather, huge window, second floor involving tall ladder balanced in a metre of snow. Jody, Leo and Barry did an amazing job. We can definitely recommend Kempenfelt and their talented staff. Thank you! We had a new garage door, front entrance door and windows installed this month and had a spectacular experience! From the salesman Brent who gave us all our options and was very knowledgeable to the installers who were fantastic, very efficient and had great attitudes! The lead hand was very knowledgeable and took us to every install at the end to go over how to use as well as to make sure everything was perfect! We were very happy with everything and everyone start to finish! Thank you Kempenfelt!